Would you like to learn more about backyard cottages and meet others thinking about building a backyard cottage? We periodically assemble experts in the design, construction and of financing backyard cottages. These workshops offer a unique opportunity to have your questions answered in an informal setting. Because our workshops often fill up we prefer it if you RSVP so we can be sure to accommodate you. Backyard cottages can be used for many things including housing a family member or as a short term rental. Join Bruce Parker from Microhouse and Stefan Hansmire from Stefan Hansmire Builds to learn more about how to plan for and establish a realistic budget for your cottage. Thursday March 7, 7:00 pm at the Phinney Neighborhood Center. From time to time we have evening open houses that we are not able to advertise. Sign up for our invite list and you will be invited to these "secret open houses". Beacon Hill: February TBD. This efficient cottage has been designed as a rental and future home for the owner. In some cases our cottages are easily viewed from the street or alley. If you would like to drive by please be respectful of the owners or those who are living there. If you would like to see inside some cottages are available to rent and we encourage you to do so. See test drive a backyard cottage. Fremont 4134 1st Ave NW. This is our most ambitious project to date. The cottage contains a table tennis room,for the husband, and a roof top deck where the wife can have her morning cup of coffee. 800 Sq.Ft. Studio, 1 Bath, + table tennis emporium. Crown Hill - 819 NW 90th St. This cottage features a 1 bedroom apartment above an art studio. Ballard - 6756 11th Ave NW. This cottage is one of our smallest 550 sq. ft. over two floors. Ballard 5014 8th Ave NW This cottage will serve as a short term rental and as a home office. Madison Valley - 3001 E Harrison St The Madison Valley backyard cottage has a collection of unique features including a powder room, mud room, and rooftop deck. Ravenna - 6011 33rd Ave NE The Ravenna cottage features territorial views and vaulted ceilings. We worked with the owner to create a carriage house with a one bedroom apartment over garage and shop space. 800 sq. 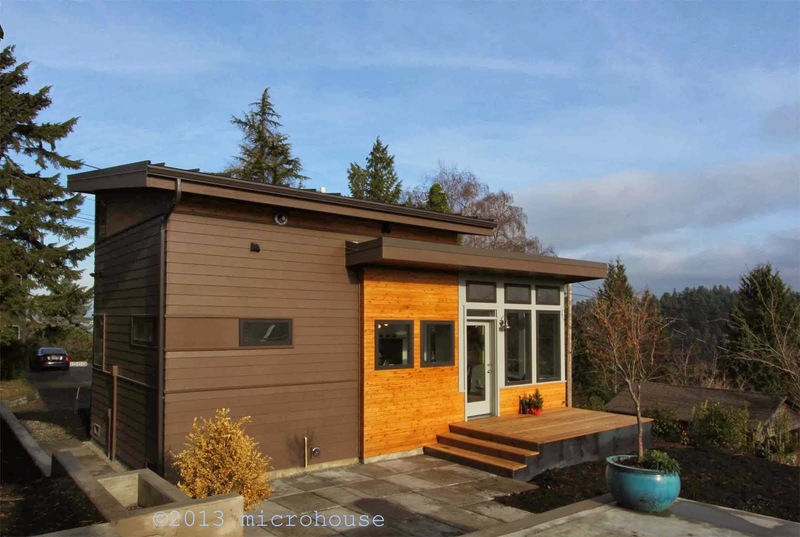 ft.
Portage Bay - 2622 11th Ave E This 2 bedroom, backyard cottage was designed to take advantage of sweeping views of portage bay while minimizing, freeway noise, and protecting the privacy of the primary residence. It was featured in the Capitol Hill Blog. Seward Park - 5200 55th Ave S The shape and form of this backyard cottage were carefully crafted to capture southern light and expansive views of Lake Washington and Mount Rainier. 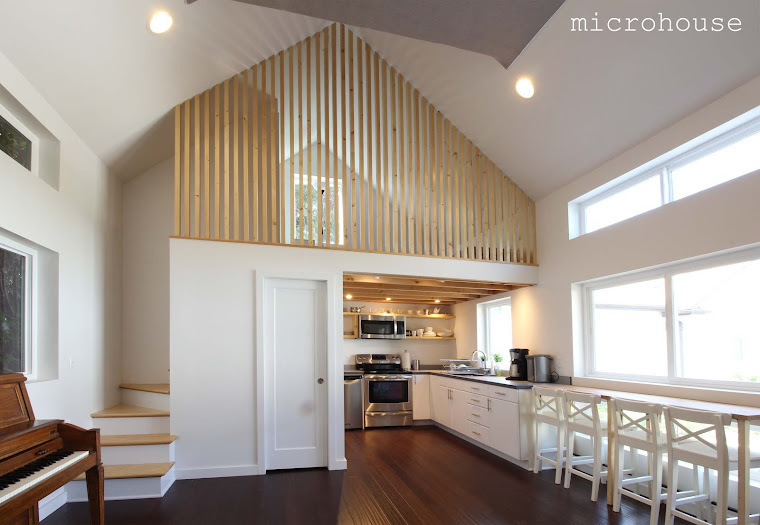 Vaulted ceilings and exposed joists make the cottage feel larger than its 650 sq. ft. size. The house features a one bedroom, bath, kitchen and living room on the main floor and a granddaughter loft. 650 Sq.Ft. 1 Bedroom, 1 Bath. Contact us for information on self guided city wide and neighborhood backyard cottage tours. Do you have specific questions about your lot? Email or call us with the address and your goals and questions and we can pull together background data that will assist us in answering your questions.